A sweet way to help burn fat! I’m into all kinds of eating — healthy eating, not healthy eating, happy eating, stress eating. Like I said, all kinds. I blame it on both sides of the family who taught me that there is no greater pleasure than just tucking in to a good meal. This was fine when I was in my teens and my metabolism would kick in if I just skipped one meal for the day (normally dinner) but — far, far away from my teen years — I have to sadly admit that my metabolism is in need of an overhaul. I have done detoxes, juice fasts, etc. which help tremendously but I cannot do them on a daily basis due to my work schedule. No, that’s just an excuse: I cannot do them on a more regular basis because I just don’t want to. The pleasures of eating all kinds of food at the moment still happily KO the need to have a complete lifestyle change. So, in the meantime, I still plough through different restaurant menus and scour the market for dietary “aids” that will help me remain fit while entering those restaurant doors. Of course, I make natural a priority as much as possible. I have tried appetite suppressants in the past (with a doctor’s prescription, of course) and although I’ve found them effective in curbing my appetite, I have also found them to effectively amp up the inner sociopath. On said suppressants I experienced an irritability that was akin to PMS on uppers. I snarled at almost everyone — my colleagues, my family and kept wondering why I was getting a headache — which I hardly to ever get. I finally realized that the only thing “new” I was ingesting were the tiny pills to curb my eating. Never again. I’d rather be a little heavier than normal than close to clinically insane. 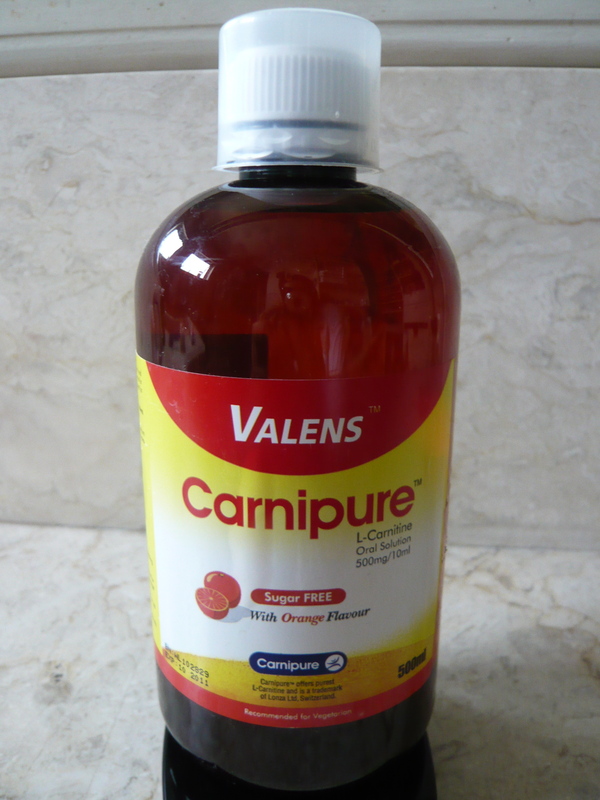 The best solution for me came in the form of Carnipure, a liquid fat burner comprised of L-Carnitine taken twice daily. On recommendation of my doctor, I was advised that I should take it with meals and only on days that I would experience activity — in other words, not on one of those lazy Sundays doing my TV series catch-up with a bowl of my junk food at my side all day. L-Carnitine is produced naturally in the body but in small quantities; when produced more, L-Carnitine enables the body to efficiently turn fat into energy. I also read that having more L-Carnitine can help one bring down stress levels and is great for athletes (or in my case, a “try-athlete”). I decided to give my bottle of Carnipure a road test. The liquid (10 ml twice a day) was sweet-tasting even though it was sugar free so it goes down easy; no discomfort there. I noticed though that after about 20 minutes you begin to perspire even if you’re sitting down. No wonder it was advised to take this when exercising. So over the weekend I first tried it, I joined a race. I took a gulp of this a couple of minutes before the race started, and — seriously — I breezed through that 5K, and it was the first race I had ever entered in my life. Yes, of course I had been training, but I felt that the Carnipure had given me energy. I have been taking it before I exercise ever since. So far, and it’s been months, I have felt no side effects and I do feel more energetic whenever I have a sip, so I do avoid taking in too late at night because I fear I won’t be able to sleep or will break into a sweat while sleeping! I also did a little research on the Internet and studies claim that L-Carnitine supplements can be taken by vegetarians, the elderly and pregnant women just to optimize their health. I would still consult with a medical professional though if you are any of the above. Weight management is aided because L-Carnitine can reduce the sensation of hunger, so if you have a wedding to attend over the weekend (perhaps your own) and you want to make sure you fit into that special ensemble, then perhaps two weeks of this plus some exercise will help you, or hey, maybe even one week if you just need to shed a pound or two. If your concern is not just vanity but your overall health, your heart can benefit from increased levels of L-Carnitine which it gets from the bloodstream. With adequate amounts there have been reports of the reduction of heart disease, especially because of lessened fat deposits in the heart. I am not saying that this is the only substitute and an all-around cure, but I started taking this to help manage my weight and so far, so good, although I know it’s no replacement for a really healthy and balanced diet and discipline on the field or in the gym. So far, though, it has been a great aid to me, and since I haven’t felt the urge to snap at a co-worker or growl at a family member since I’ve taken it, I feel I can eat, drink, and be merry for a little while longer. i so want to try Carnipure!